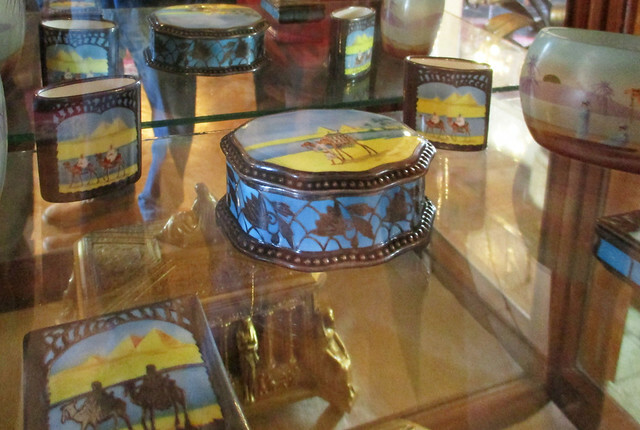 Linda wanted to make another stop at Egypt Equine Aid with cookies for the staff. There was a new face at the horse rescue farm, Phillipe, from Chile. 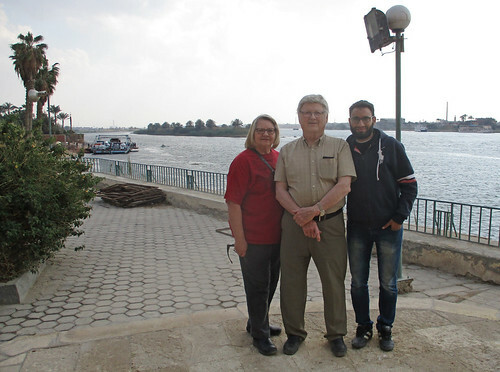 He was a very interesting person to chat with and had interesting stories about his introduction to Egyptian society. 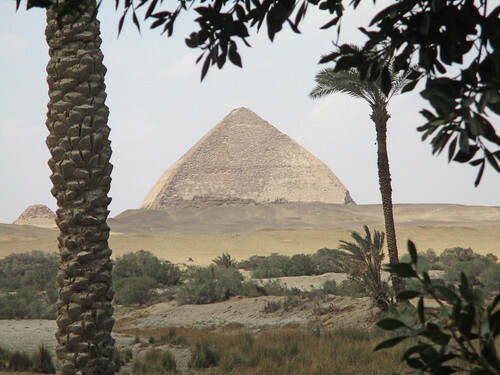 After we dropped Linda at the farm, Roshdy and I headed for Dashour for more pyramid photos.I just can't get enough of them. 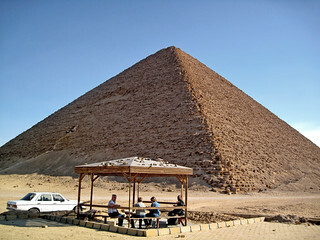 The pyramids that we commonly visit, lie along a fifteen mile stretch of the desert's edge parallel to the Nile. 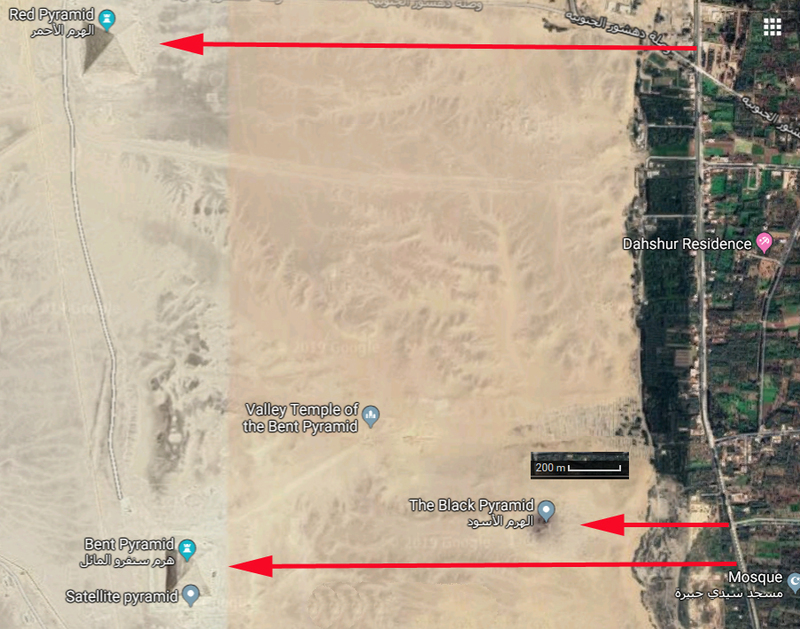 Google maps says you can walk from the Sphinx at Giza all the way down to Dashour in five hours. For a younger couple, this would indeed be an interesting day's outing. We traveled about half of that trip by camel, with a walking guide, in about three hours back in 2015, described here. Roshdy had in mind a drive from EEA down to a spot just beyond Dashour where we would be able to see the Red, White and Black Pyramids. 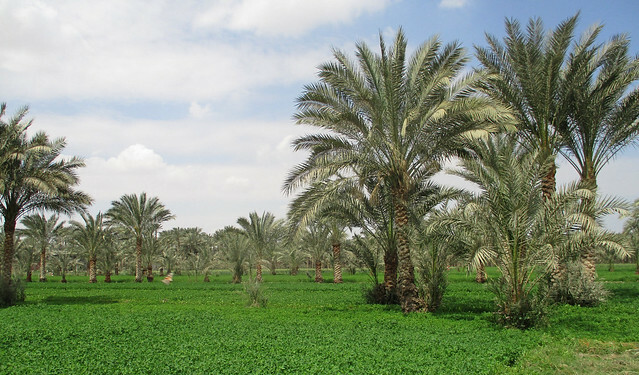 It's easy to tell when you approach Saqqara and Dashour as the plantations of date palms begin to appear. They are a fall crop so all we see now in the trees are the green leaves - no dates. 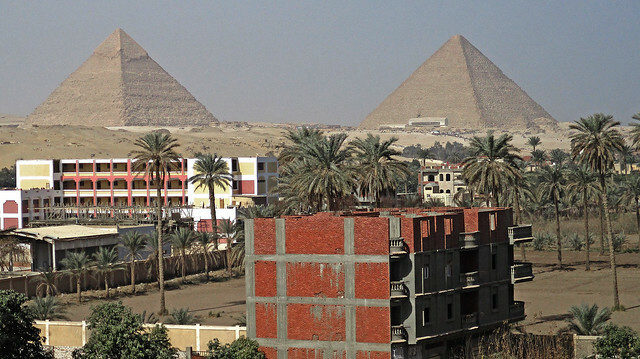 We have a good collection of pictures of the "Red" and "White" pyramids from previous years. 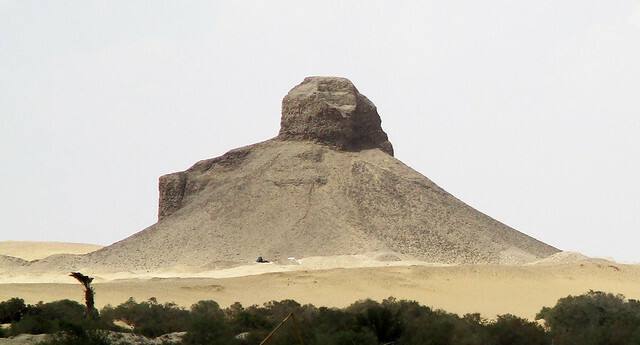 But the "Black" pyramid has remained elusive since it is about a mile away from the access road to its companions. From the road we took going just a bit south of the official tourist entrance, it was easy to see all three of these pyramids - because of the difference in their sizes, they look almost equidistant from this vantage point. 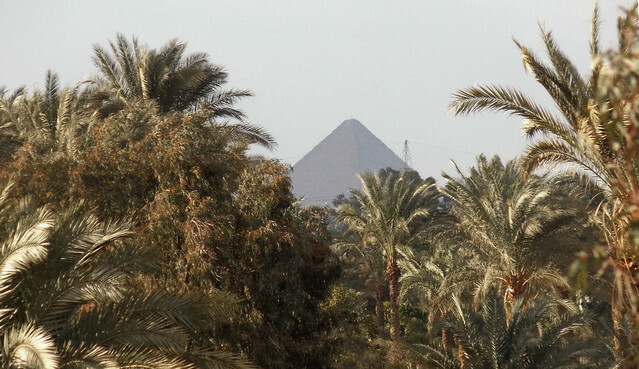 The "White" or "Bent" pyramid takes on a very different appearance from here, framed by the palms. And I finally did get my picture of the "Black" pyramid. As I was browsing the Google map looking at the areas along the Nile around Saqqara and Abu Sir to the south of us, I also looked at the area on the opposite side of the river around the Cairo suburb of Helwan. 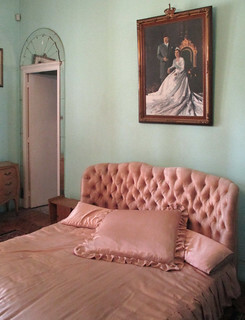 I stumbled onto a highly rated (*) wax museum and the King Farouk Palace Museum. That seemed like enough to merit a visit during our last few days here. But he still gave it five stars? You can only imagine our disappointment when we reached the site and were told it has been closed since the revolution! Wikipedia's entry says it was closed in 2009 for renovation - apparently a lengthy project. On the other hand, WikiCommons provides a picture that appears to come from May of 2016. 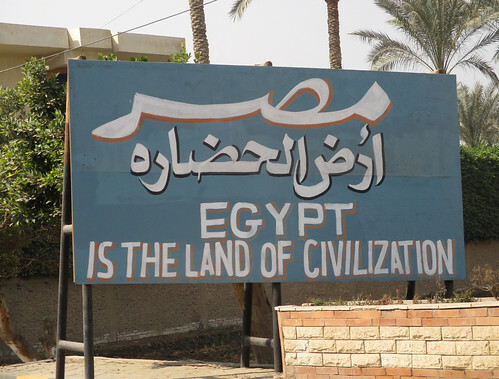 This is Egypt. You just don't know - even when you ask. 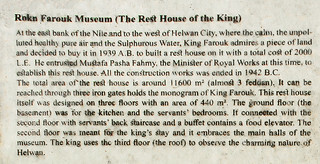 We moved on to the Museum Palace of King Farouk along the Nile. 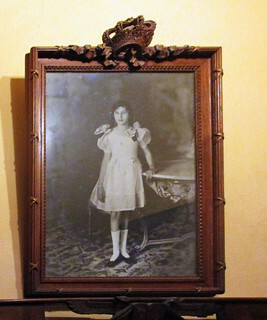 That is a picture of a model of the palace that is on display near the front door. 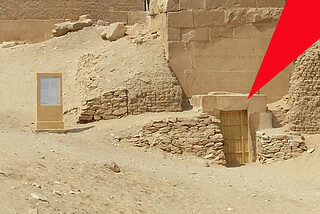 The king had two "rest houses" - the better known one is found near the great pyramids of Giza. The front entrance to this one is not very imposing. 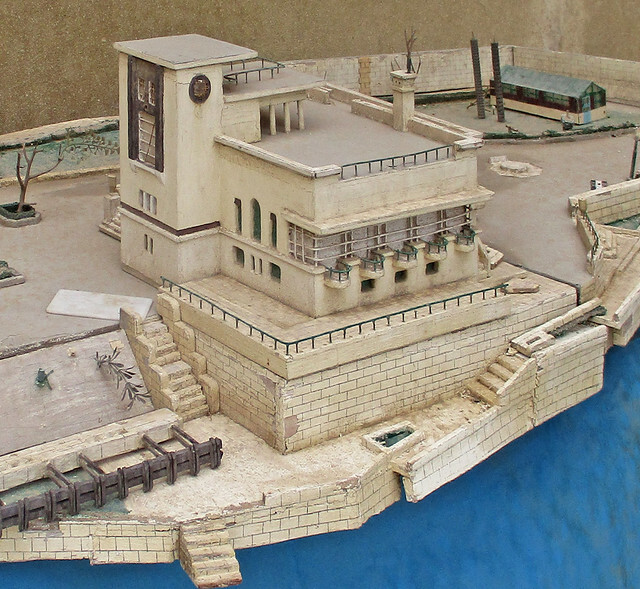 I pictured the king arriving and feeling very underwhelmed until I realized that he would arrive via the Nile on the royal yacht at the dock depicted in the model. Here is the actual front entrance. 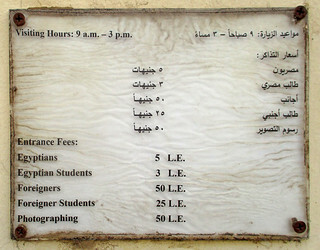 Admission is only 50 EGP (about $3) for a "foreigner." Locals get quite a break at only 5 EGP. 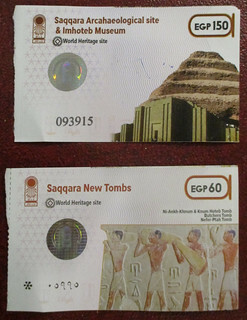 We look at that and think "How nice that Egyptians get such a discount to learn about part of their history." 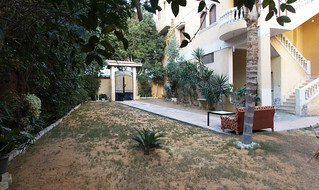 It is easy, however, to find Egyptians who will interpret the discount differently. "The government is saying we are worth only one-tenth of a foreigner," is their view. Only the first floor of the home is open to the public so this is not a long tour but there is a lot of "story" packed into the tiny museum. The era of King Farouk, who ascended to the throne in 1932 at the age of 16 and was deposed in the revolution of 1952 has inspired numerous books. 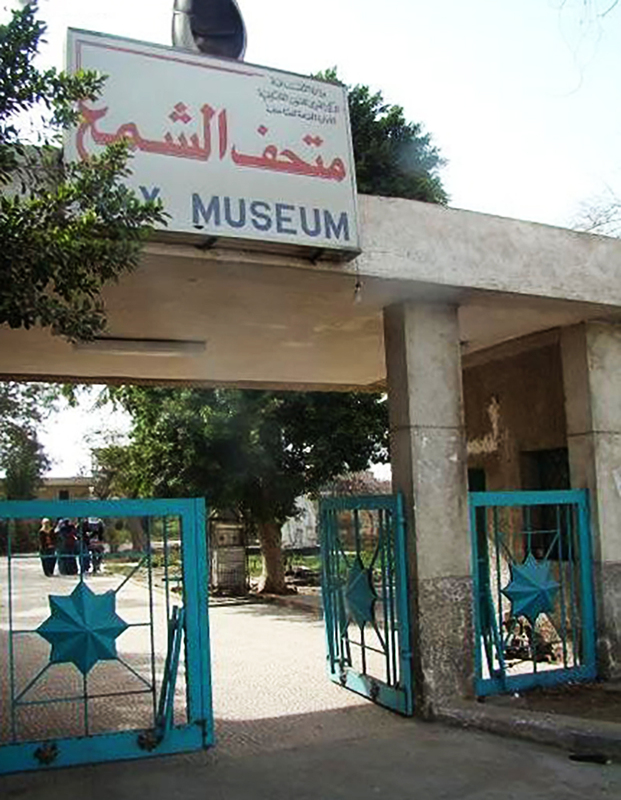 Local museum guide, Ahmed, filled in details for us about the photos, paintings and antiques. He said the king seldom visited this rest house. 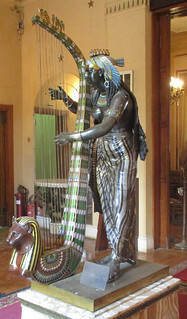 While there are three floors in the building, only the first is open to the public. 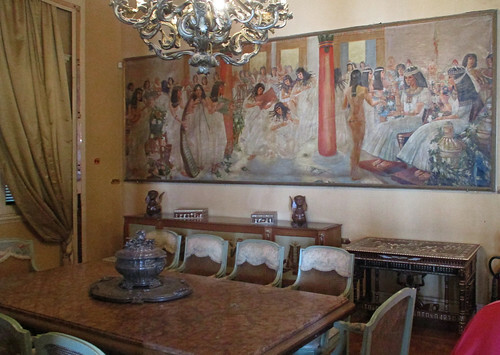 Today, the Museum houses furniture that was once used in the royal rest house by the pyramids of Giza. 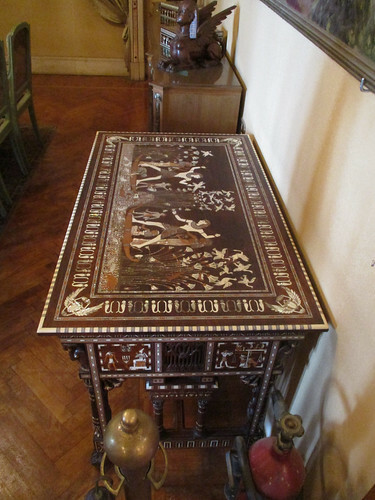 Much of this furniture is inspired by ancient Egyptian art, or direct copies of ancient Egyptian furniture. 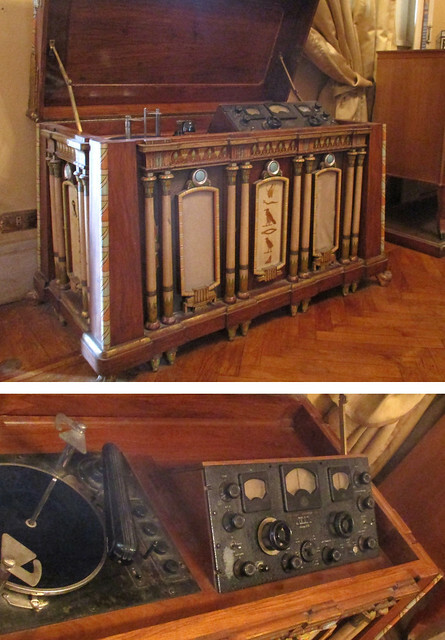 I thought that the radio/phonograph was one of the most interesting items. Others may have a different opinion. I pictured the king sitting by the radio, drawing smoke from his water-pipe as he tuned to the BBC, French, Italian and German broadcasting services during the build up to World War II. 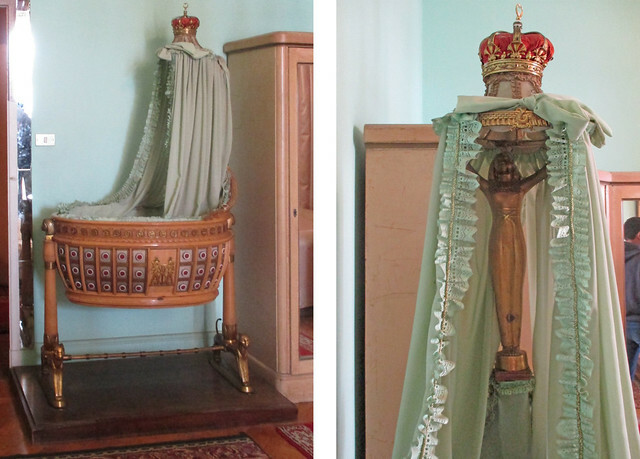 The photo of Farouk's sister, Princess Fawzia, and the royal bedroom with bassinet for the son might get a visitor interested in checking out some twentieth century Egyptian history. 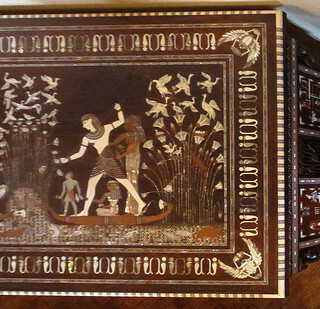 A curio cabinet has some particularly nice looking boxes that we have not seen being duplicated by today's local artisans. The grounds seem very well maintained and later in the year probably have a good deal more color, but they seemed nice enough for us to pause for a portrait even now. 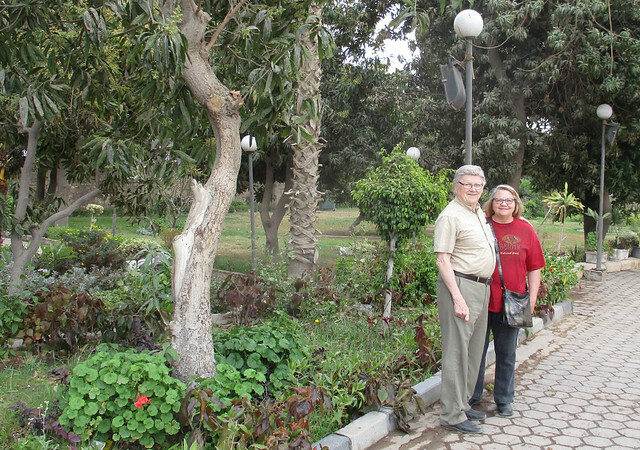 Following the museum visit, we headed back into town and stopped just past the Ring Road at Antar, a restaurant along the Nile Corniche for dinner. 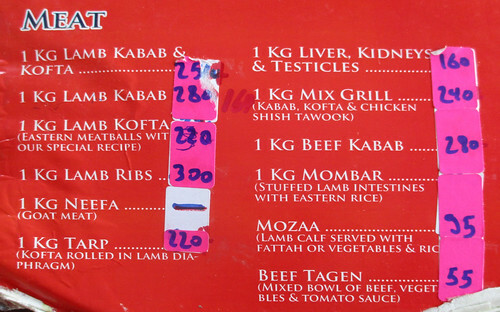 The English language version of the menu displayed only a fraction of the total items available - and was not particularly inspiring. 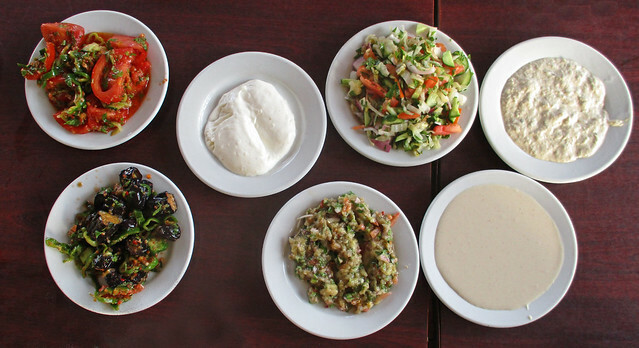 This turned out, though, to be one of our best meals of the winter. 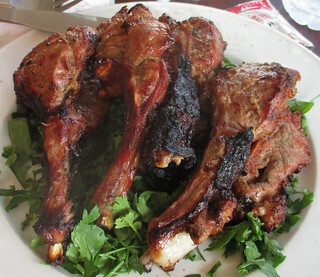 The lamb and chicken from the grill were excellent and the appetizers were by far the best we have been served. The Helwan Wax Museum stands among several museums abound by the city of Cairo, located in Helwan suburb and is one of the most important museums in Egypt not only because of its rare holdings telling the stages of evolution in the Egyptian history from the beginning of the Pharaohs to the modern era, but also with the contents of the museum’s meticulously made waxy statues that mad professionals to put the museum in the second place on the most famous wax museums in the world. 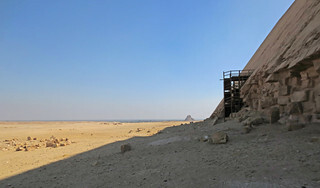 I just realized that we have almost completed our three months in Egypt without a "pyramids post" on the blog. It occurred to me that I might not have many current pictures to use for one, but I discovered 85 and have sorted out a few of the better ones for you. Roshdy drove us to the horse farm. 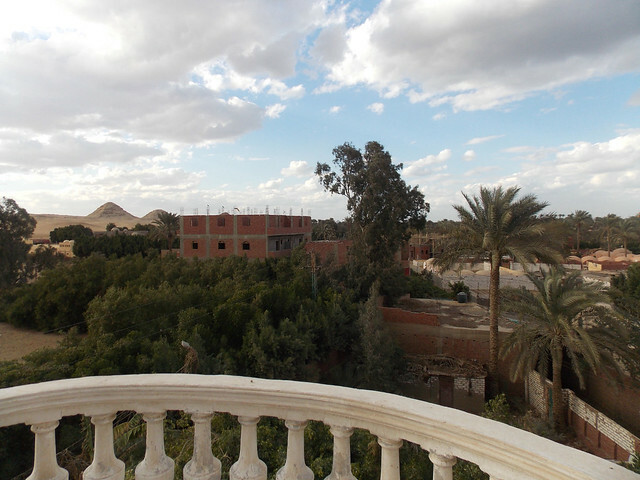 Then he and I went over to the nearby Sakkara View Guest House. 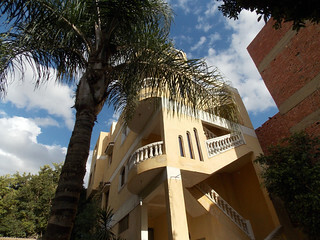 This is a quiet boutique hotel with a marvelous view of the Step Pyramid at Sakkara about a mile to the south. There is an equally impressive view of the Abu Sir pyramids to the west and, on a clear day - which this was - the Great Pyramid about ten miles back to the north in Giza. 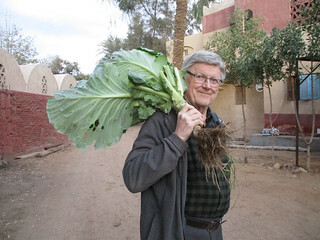 While Roshdy and I were enjoying some koshary from a local take-out operator along with Mohammed, the hotel proprietor, Linda and Jill were looking through a nearby cabbage patch. 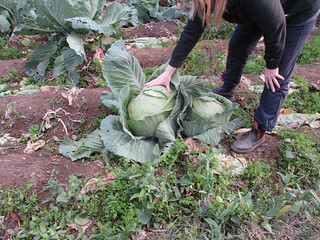 Linda harvested one which kept us in cabbage for the next couple of weeks. 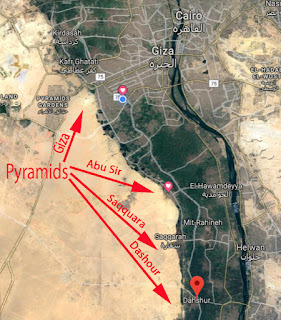 Another notable pyramid sighting happened when we were visiting a friend who is building a home not far removed from the pyramids of Giza. I also got a picture when we were stuck in traffic coming back from Tunis/Fayoum - this shot betrays the very urban setting of the Giza pyramids. 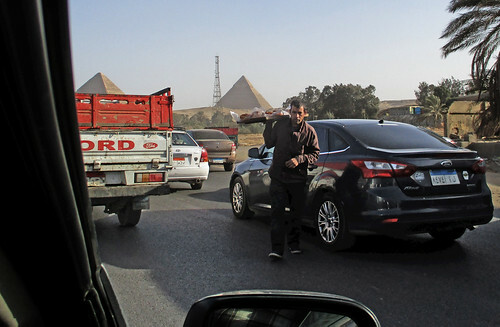 And, any time traffic comes to a halt here, someone is sure to be out selling something to eat. I'm going to miss that back home. 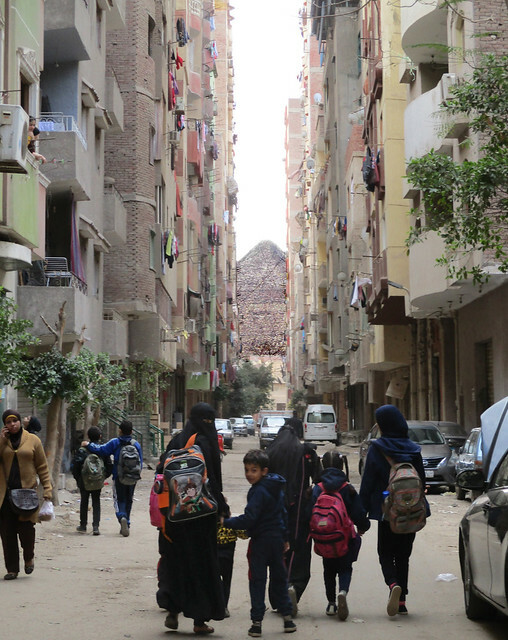 Speaking of urban settings, we were out on a long walk a few days back and caught this view of the Great Pyramid down a narrow street as we looked into the afternoon sun. 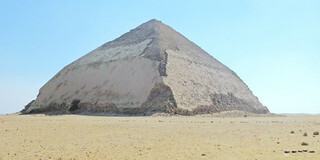 If you would like to see more pyramids, click on any of these pictures and explore this year's pyramids album on my Flickr site. 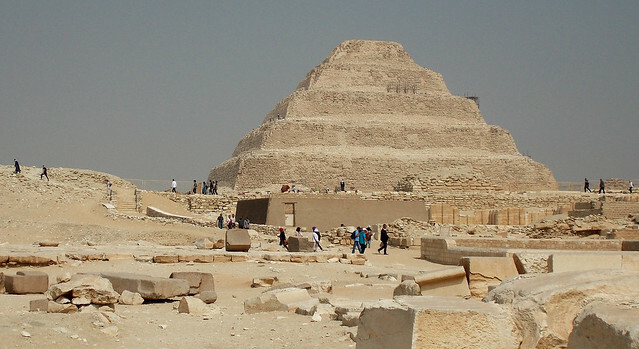 Or click on the pyramids label at the bottom of this post and you will be taken to all previous pyramids posts. Or just click right here to get to one of the better posts from six years ago..
Of course, it's not really new - just newly opened to the public. And it is not even newly discovered - that happened in 1940. 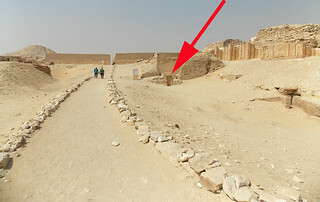 While the French Egyptologist, Pierre Montet, was exploring the 3000 year-old "newest" tombs of ancient Egypt at Tanis which we visited here, Egyptian Egyptologist, Zaki Saad, was exploring the 5000 year-old oldest tombs at Sakarra. 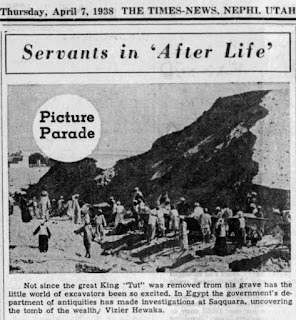 In 1940, Saad discovered the tomb of the king's vizier, Mehu. 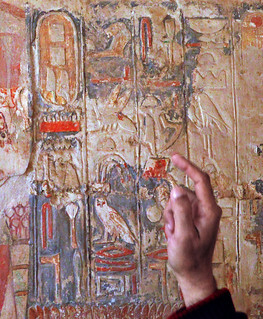 Two years earlier, Saad had discovered the nearby tomb of another king's vizier, Hewaka, to much world interest. 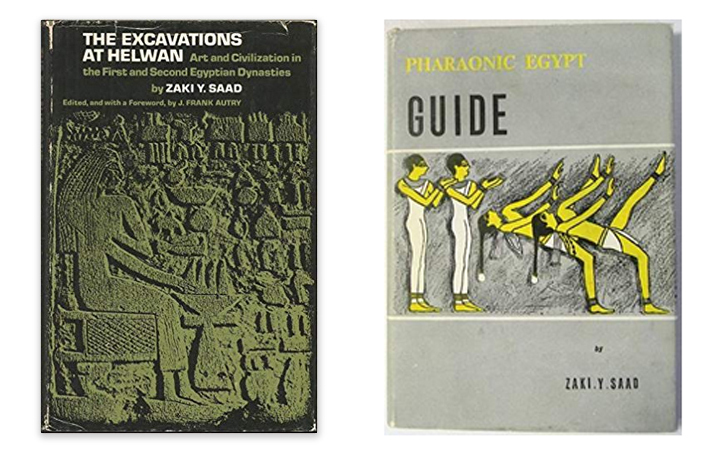 Zaki Saad had a big advantage over the foreign archeologists for the next several war years. 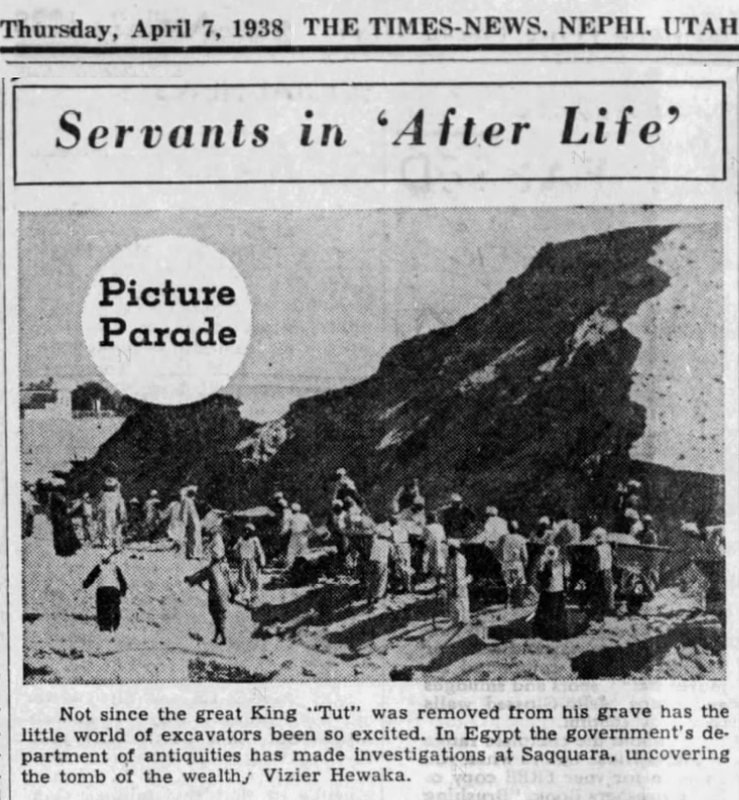 As French, German, Italian, British and U.S. archeologists were either unwelcome or out of money, King Farouk was able to nurture his personal archeological interests with funding as he saw fit so he funded Saad. 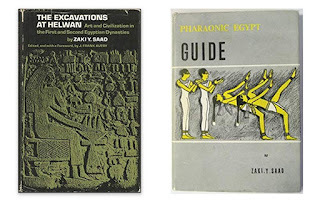 Saad moved across the Nile from Sakarra to Helwan in 1942 and set up shop in a huge newly discovered ancient graveyard where he spent the next twelve years excavating the remains of 10,000 graves mostly from the common Egyptians of the first few dynasties - around 3000 B.C. 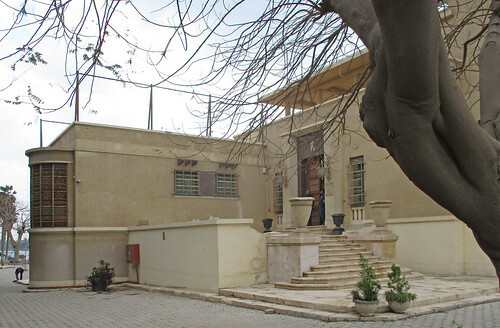 King Farouk kindly provided a headquarters building for this dig which included a home for Saad and his family. 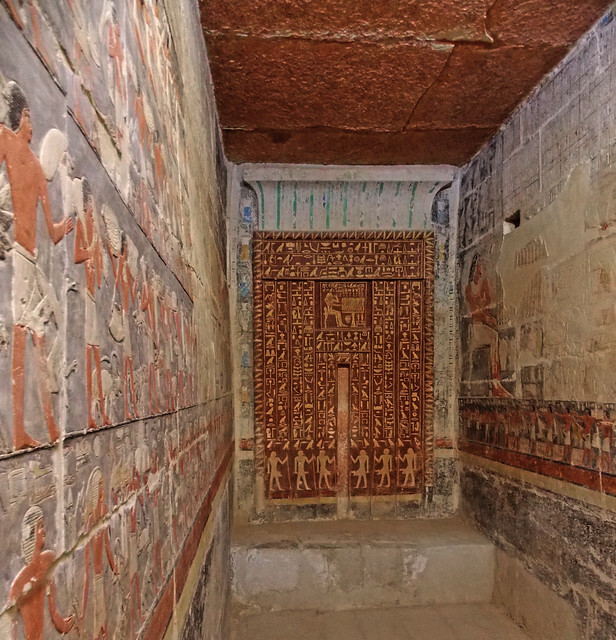 There is reportedly a collection of some 6000 objects from this work tucked away in 158 crates in the basement of the Egyptian National Museum. Hopefully, these will emerge one day at the new Grand Egyptian Museum when it finally opens. 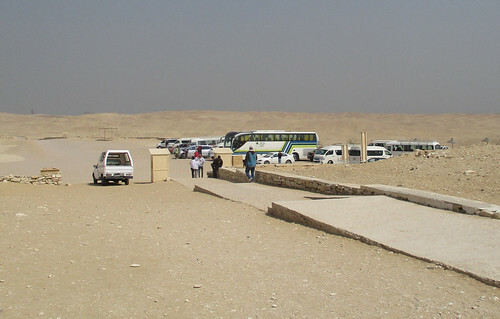 The tourism business is good at Sakarra. The parking lot is filling up once again. A few years ago we were one of perhaps a half-dozen vehicles here. I have been coming to Sakarra since 2003. 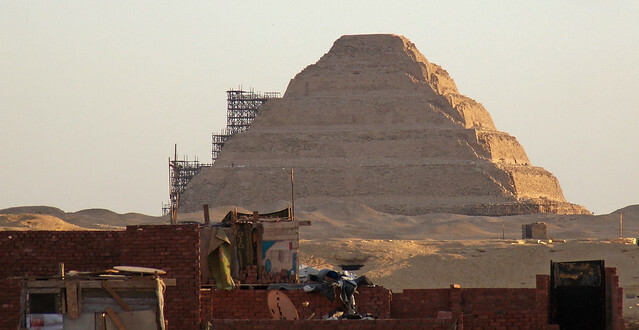 Scaffolding has been up on some portion of the Step Pyramid of Djoser during all that time. People joke that the scaffolding itself has become an antique. We walked along the southern edge of the main site to the location of Mehu's tomb. 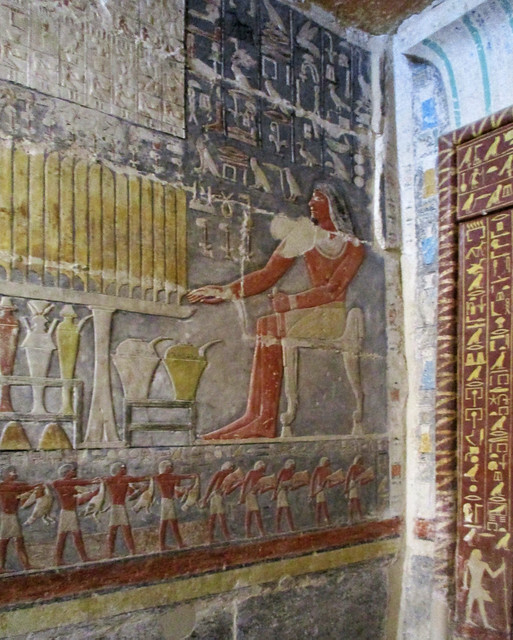 Of course, being "open to the public" does not mean the same thing here as back in the U.S. You have to know the tomb exists, then go find someone to call the man with the key who will then unlock the door for you. 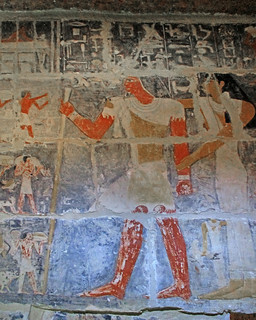 Yes, you need a competent guide like Roshdy to do a tour of Egypt. Don't try to "wing it." But Mehu did lay out a nice spot for himself and his son. The pictures speak for themselves. All the colors are original. The ceiling is granite. And what about that old Egyptian Archeologist, Zaki Saad? Where is he buried? Glad you asked. After he retired in 1960, he went to work for the U.S. embassy doing tours for visitors (presumably VIPs from places like the Minnesota International Center.) 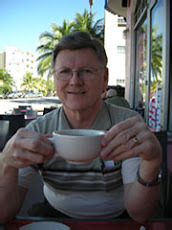 He and his family emigrated to the U.S. in 1966 and ended up in North Carolina. Zaki and his wife, Marcelle, are buried in Pinecrest Memorial Gardens in Clayton, NC. 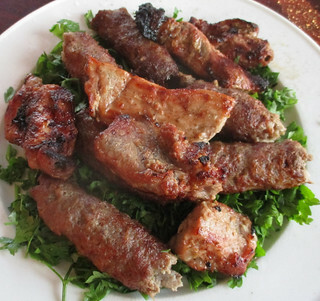 Zaki managed to hook-up with a dentist from Corsicana, Texas, who was a frequent Egyptian visitor and together they published a book for the U.S. popular marketplace. You can find a couple of Saad's books on the used market at Amazon. Zaki and Helwan are going to be on my list for next year's "things to do in Egypt." Zaki's son, later joined by his sisters, operated a radio/TV repair business that grew into a small television appliance and mattress chain based in Garner, NC. And now you know "the rest of the story."